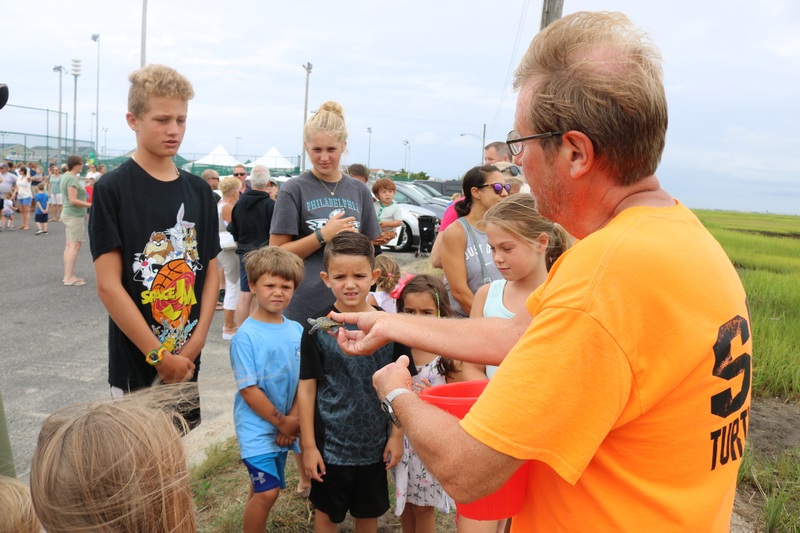 Sea Isle Terrapin Rescue Co-Founder Steve Ahern shows how tiny a baby terrapin is to Danny Royds, 6, (grey and black shirt) sister Emily, 4, (right) and other kids and adults during a turtle release at Dealy Field Saturday. 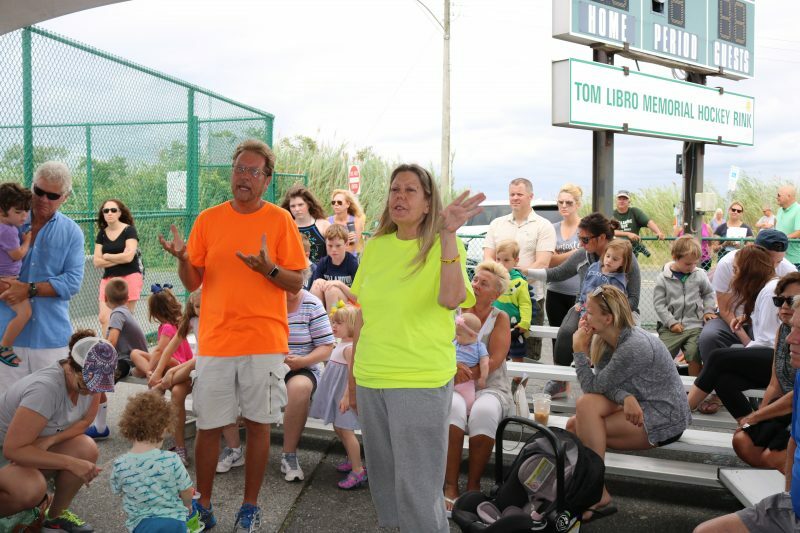 “Does anyone know who is bigger, a girl or boy turtle?” asked Sea Isle Terrapin Rescue Co-founder Steve Ahern. Danny Royds, 6, of Downingtown, Pa., and Sea Isle, knew the answer. “I know because a girl turtle needs to hold a lot of eggs,” he said. 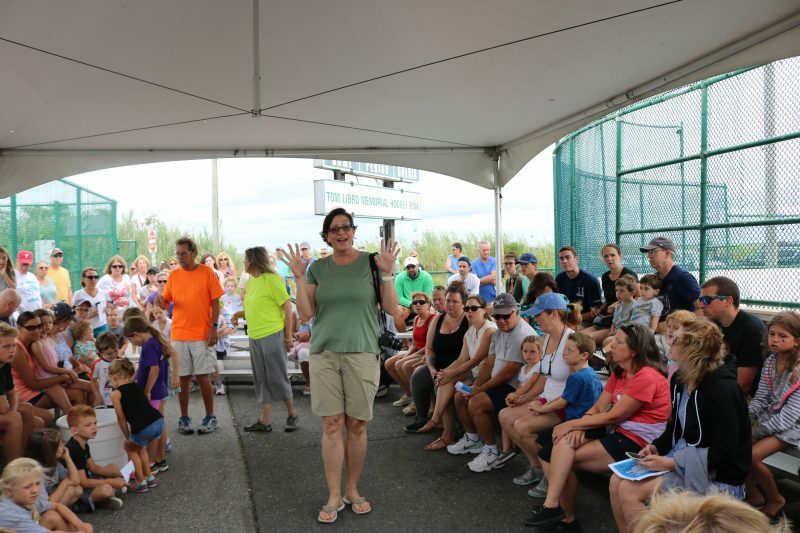 Danny was one of scores of kids and their families, who joined Steve and Susan Ahern, of the terrapin rescue, for an educational and fun turtle release Saturday at Dealy Field, 59th Street, which began with crafts and a presentation by the Aherns. “I’m excited to see the release of the turtles!” exclaimed Danny, standing with his sister Emily, 4, and 8-year-old brother Michael. “Danny is very happy to see this,” mom Jennifer Royds said, adding her son wants to be a scuba diver when he grows up. Kids check out the terrapins before the release. 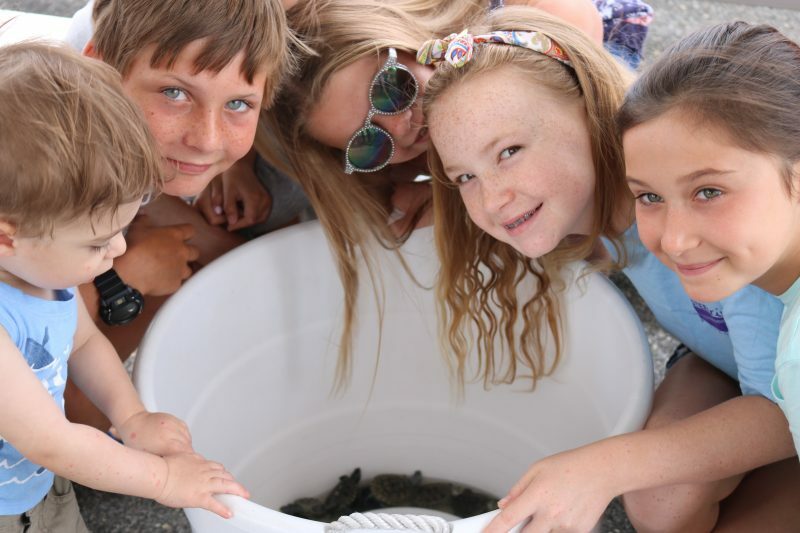 Kids were broken into 10 groups to see, touch and watch, 10 baby diamondback terrapins find a safe spot to make their new habitat near the water’s edge of the bay. Steve Ahern took the terrapins nearer to the water for his releases, while Susan Ahern set them in the grasses farther from the water. The children watched in awe as the cute hatchlings meandered through the grasses. “This one needs a little help,” Steve Ahern said of one of the terrapins having a bit of trouble navigating the vegetation. 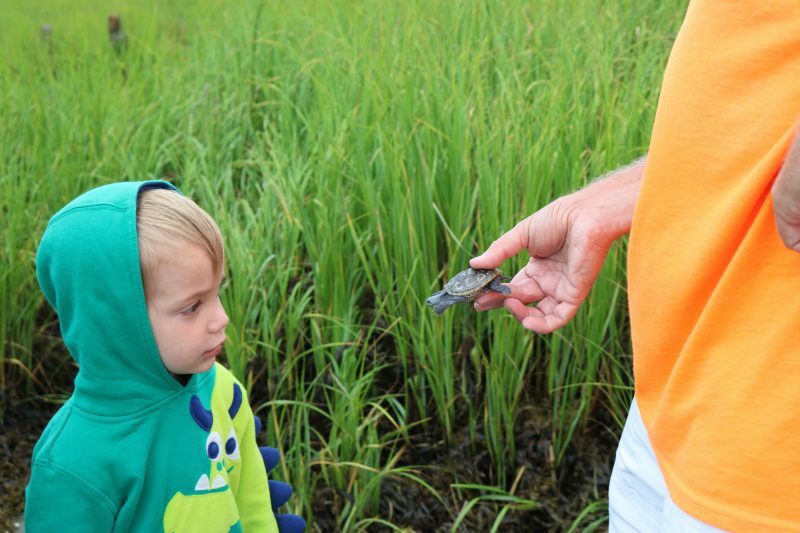 Sully Maahs, 3, of Fort Washington, P.a., looks in awe at a terrapin Steve Ahern is getting ready to release. He assured the kids that the terrapins need to adjust to their new surroundings. 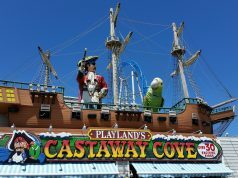 “I never saw this before,” said a smiling Taylor Rowbottom, 8, of Delran, and Sea Isle. Her little sister Chloe Rowbottom, 4, remarked that the terrapins were so tiny. Only one egg in a thousand grows up to be an adult turtle, Steve Ahern said, adding that it is very important to release turtles in a safe environment. 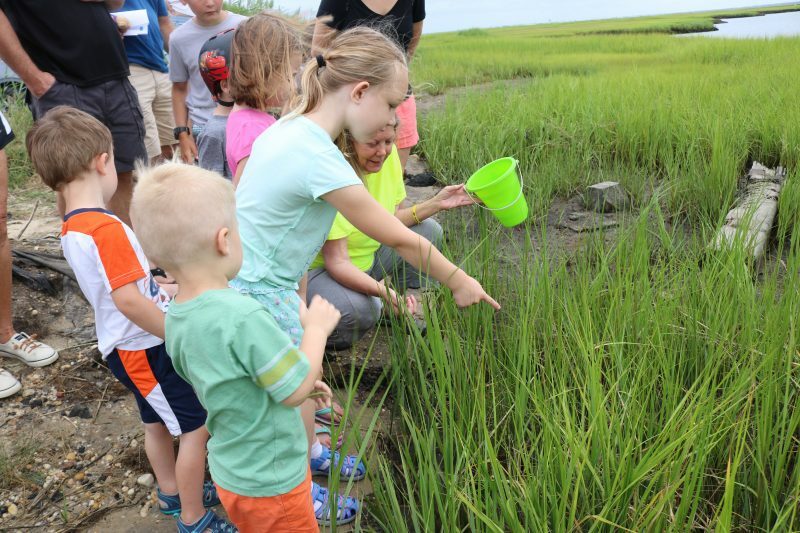 The terrapins were hatched from eggs saved from injured or dead terrapins from Sea Isle last year that were incubated at the Wetlands Institute in Stone Harbor and then sent to Stockton University for the winter, Steve Ahern explained. 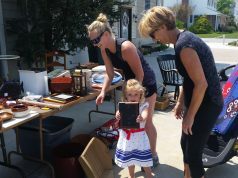 A little girl points at a terrapin Susan Ahern just released. Diamondback terrapins can live for 30 to 40 years, but with roadwork, construction, shore traffic, and deaths related to the fishing industry, longevity is a constant concern, the Aherns have said. They made it their passion to rescue terrapins nearly a decade ago. Since then, they have rescued thousands of terrapins. They told the crowd that if someone sees a terrapin in distress he or she should call their rescue group or contact the Wetlands Institute. They also explained that the terrapins people see on the roadways or in the grasses are most often females coming back or getting ready to nest. The Aherns give an interesting and informative presentation to the crowd. 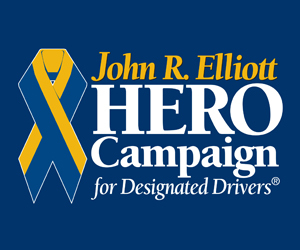 The Aherns cautioned the crowd that safety is always the first priority. If a person sees a terrapin that should be moved and could be moved safely, move the turtle but keep her facing the direction she was heading. Terrapin nesting season began around Memorial Day weekend and just ended a few days ago, Steve Ahern noted. Sea Isle Terrapin Rescue is a volunteer organization that works with city agencies and local volunteer groups to promote the survival of the diamondback terrapin. 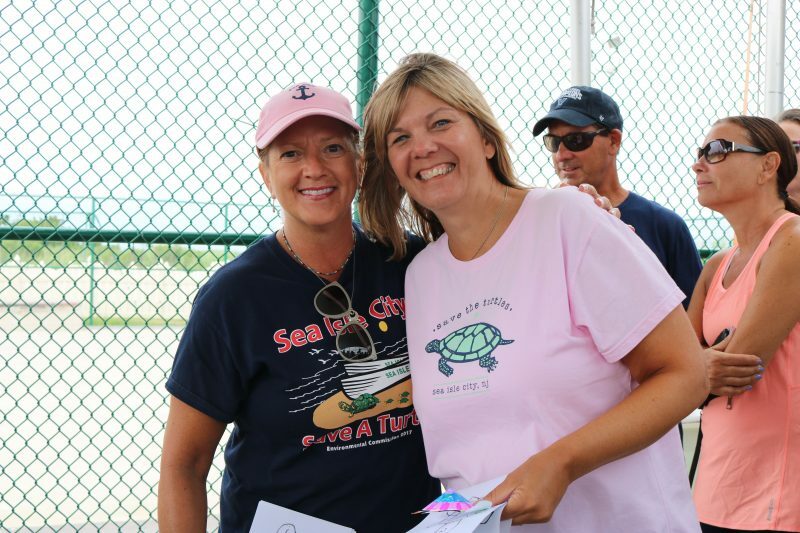 Eva Stephens, who summers in Sea Isle, helped out at the turtle release. 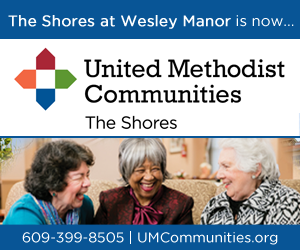 The event was hosted by the Aherns in cooperation with Sea Isle City. For more information about the Sea Isle Terrapin Rescue or to reach Steve and Susan Ahern call (609) 263-7358. If you see an injured turtle, call the Aherns or the Wetlands Institute (609) 368-1211). 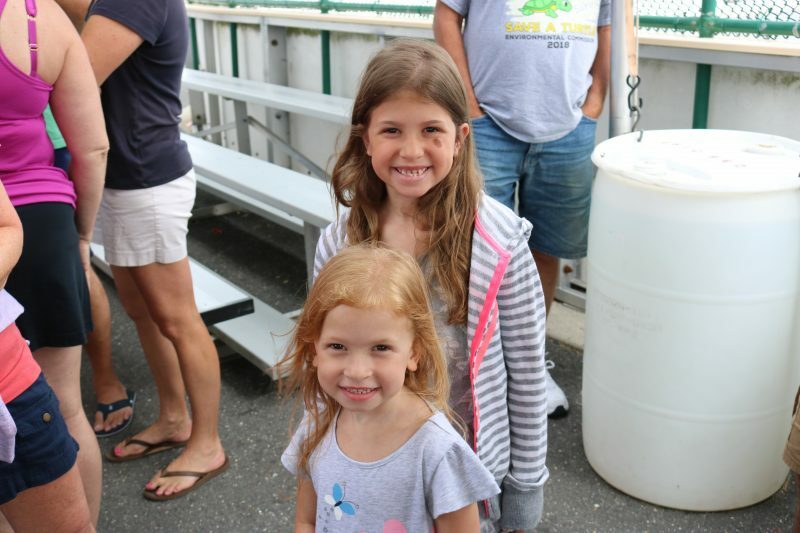 Sisters Chloe, 4, and Taylor, 8, Rowbottom of Delran and Sea Isle, are excited to see a turtle release. Susan Ahern helps the kids with their turtle crafts. 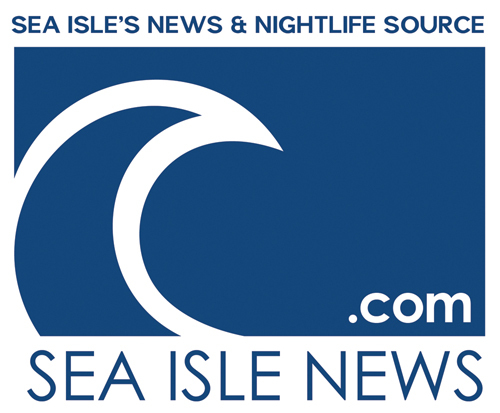 President of the Sea Isle Historical Museum Abby Powell chats with Eva Stephens. 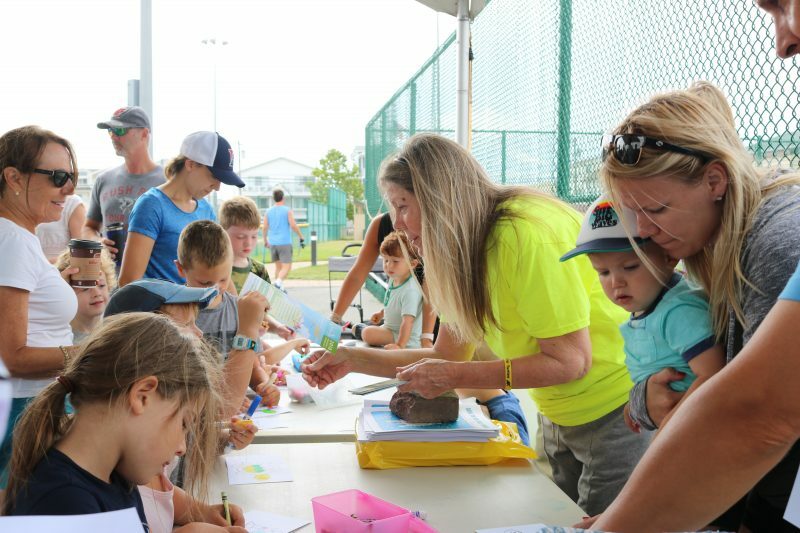 Sea Isle Public Information Officer Katherine Custer explains that kids would be broken up into 10 groups for the 10 turtle releases.